The Broadway Grill has several black metal mesh tables and chairs under red market umbrellas out front on the sidewalk. Inside is an extensive space with large windows on two sides. 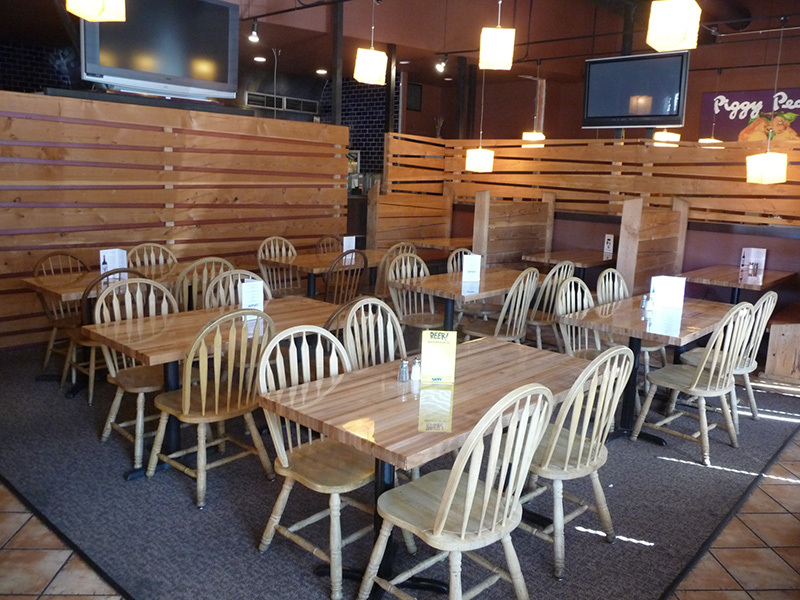 The main room has eclecticly constructed light pine booths with padded seats. 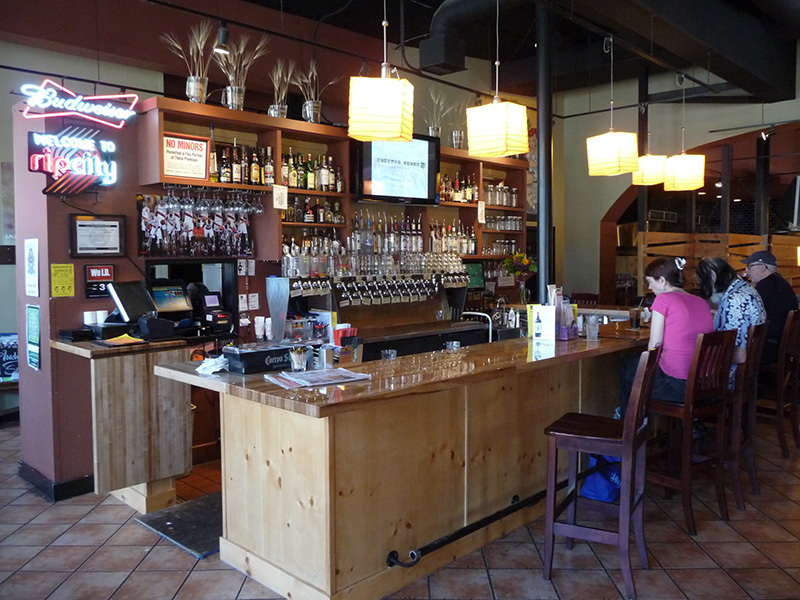 The bar made of light pine and lined with tall dark wooden chairs is in the same room. The high ceiling is black with white ceiling fans. Spotlights and hanging Japanese lantern fixtures provide the lighting. Two other rooms connect with the main one on either side of the bar, one with pool tables, game machines, and other diversions. 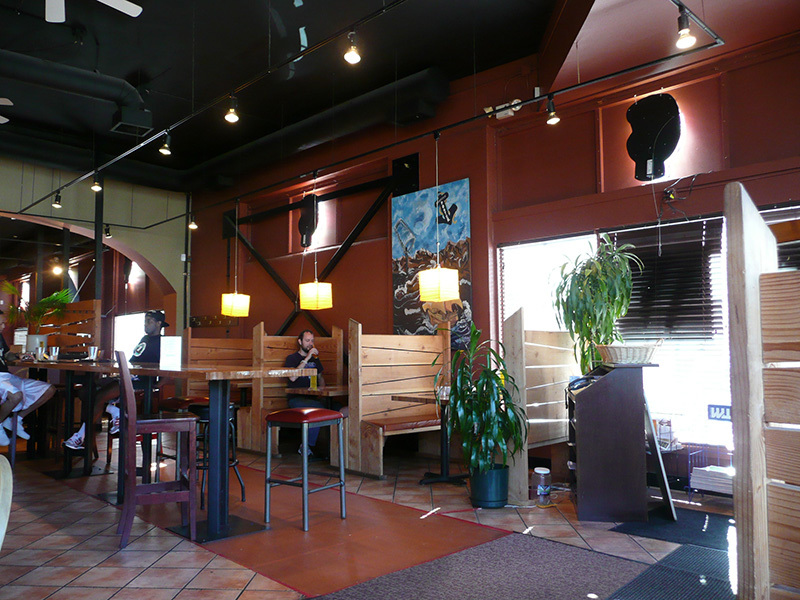 Overall, the atmosphere is that of a casual restaurant rather than a pub. The food menu is extensive but consists mostly of traditional pub fare, albeit of decent quality based on the meatball sliders we tried. There were eleven house-made beers (essentially tweaks of the usual range of ales), two seasonals (both â€œBelgianâ€ style), and several guest taps on our visit. The British Bombay IPA we tried was respectable. The biggest drawback on our visit was that the servers knew nothing about the beer. 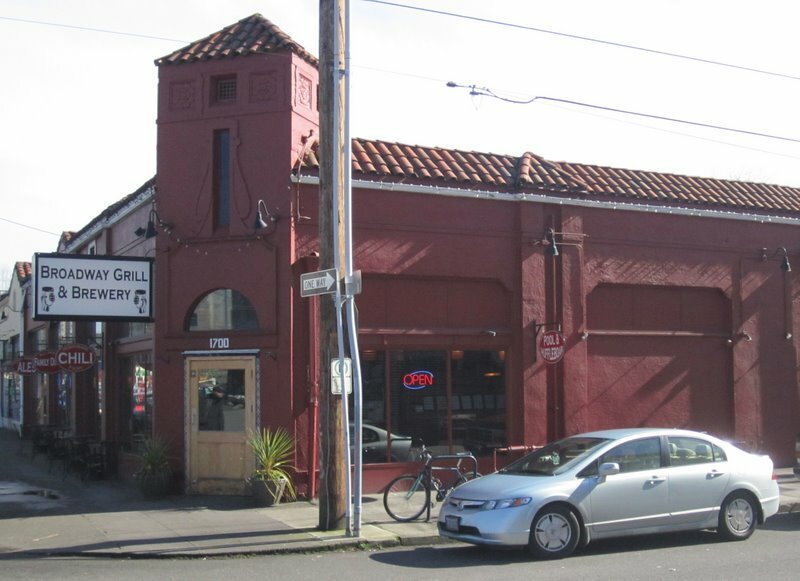 Nestled in an older building on busy Broadway, this place is larger than it first appears. There are 8 booths that line the windows. The small bar is in the center and it seats about 10. More booths by the bar and a two semi separated back rooms. High ceilings, lots of windows and plants make this a bright and inviting space. The tables are decorated with a small vase that contains barley sheafs and malts. Throw in some great music (Dire Straights, Natalie Merchant, Lyle Lovet, Springsteen, Elvis Costello, the Tubes, etc) and some funky art work, a friendly crowd and it adds up to the pleasant atmosphere. Very kid friendly. They have a decent pub grub menu with some fantastic specials. My chili was very good. The service was fast and friendly and my waitress could easily describe the beers. Note that the back of the servers shirts feature a design very close to the old BA logo of a hand holding a pint. They have a great selection - 11 regulars (2 reds, a golden ale, a Wiez, a fruit/wheat hybrid, a Green Apple Ale, Porter, Nitro Stout, Pale Ale, ESB & an IPA) plus 2 seasonal offerings (Maple Vanilla Porter and a Dark Belgian). House beers are 2.75 per glass, 3.85 per pint and a very reasonable 10.95 per pitcher. They also offer some guest beers, which included Widmer Hefe, Terminal Gravity IPA and a rotating guest tap. They also offer Bud, Bud light (2.95 per pint) and PBR (2.23 per pint). They have decent sized and very clean washrooms. They also employ the most powerful hand dryer I have ever encountered! I like their slogan of "Drink the Beer We Make Here". Trust me, its good advice!! I highly recommend a stop by this friendly and fun brewpub! !